Even today, there is no one single way of even categorising these stars. The GCVS continues to adopt a rather confusing arrangement for its "I" stars, with a variety of modifying suffixes (IN, INB, INAS etc) which do not seem to be based on physical criteria, though to be fair, the GCVS is just that - a catalogue, not an astrophysical treatise. Any taxonomical system, whether it deals with stars or plants or anything else, should be a guide to what things are, not what they look like. Previously these stars were lumped together as 'Nebular Variables' which were then divided into T Orionis, RW Aurigae and T Tauri stars. This rather older system may be closer to what we are looking for, as it does seem to be based on physical processes, as well as introducing a threefold classification which we will adopt here, even though it isn't the same threefold classification. In fact you've already met it in the "what and why" pages. It's the I-II-III system which is being increasingly used in the professional community, and was devised by our very own Prof. Bill Herbst! It's a good system for AAVSO observers, as it is, to a large extent, relevant to the actual light variations that we observe. to add to the taxonomic confusion, there is a different I-II-III system (actually a 0-I-II-III system!) which works in an inverse way to Bill's. Whilst this system may in some ways adhere closer to the physical processes going on in each type, we shall use the Herbst system here for reasons of straightforwardness (and flattery). Type I, as we saw, is given over to stars where there is no circumstellar disc and the variations are usually quite small and show some periodicity due to the bright and dark spots on their surfaces reappearing as the star rotates. Type II stars have a disc present and show greater amplitudes as well as increased irregularity. Both these types are included under the T Tauri banner. Type III show occasional dips in brightness due to obscuration by mass concentrations in the disc. There may be traces of a period visible here, such as the recently-discovered interesting star V730 Cep. These stars are called UX Orionis stars, or UXORs. So far, we have been considering stars whose masses are broadly similar to the Sun's. There is a good reason for this, in that most stars have masses of roughly the same size, between 0.1 and 10 times solar. However, there are of course more massive stars out there, and these are represented by the Herbig A and B stars. Since these objects have prominent emission lines in their spectra, they are usually called HAEBE stars, and they are the higher-mass counterparts of their more modest T Tauri cousins. A well-known HAEBE star is R Mon (right) which was incidentally the first object photographed with the famous 200-inch telescope on Mount Palomar. 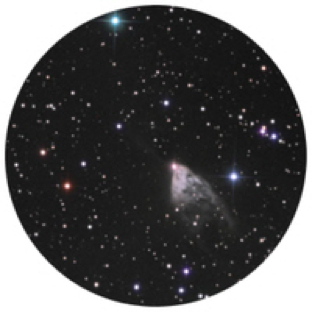 Many of these stars illuminate small fan-shaped nebulae. That's not because there happen to be a lot of nebulae of this shape; the real reason is more interesting. To find out why, go to the YSOFAQ page! HAEBE stars, like the UXORs, are surrounded by gas shells or discs and so are very important from the point of view of the formation of planetary systems. Many, such as R Mon, are observationally difficult to estimate because they are still swathed in nebulae, which they often illuminate. Sometimes - as in the case of R Mon - the nebulae appear to vary along with the star. Occasionally, the circumstellar disc can initiate a more drastic, but also more gradual, change in the brightness of the system. In the FU Orionis and EX Lupi stars (FUORs and EXORs - EXORs are FUORs writ smaller) it is thought that this surge may be due to the system drawing in gas from the surrounding cloud and igniting it, either in the disc itself or on the surface of the star. The central stars of FUOR systems seem to be 'regular' T Tauri stars - indeed the FUOR V1057 Cyg (in the North America Nebula) used to be classed as a T Tauri star. It is likely that FUORs represent a stage in the star formation process, and it is believed that the brightness surges may be periodic. It's just that we haven't been around long enough to witness more than one eruption on the same star! This may go some way to explaining why these stars are so rare; although another good reason is that until recently, we haven't been watching out for them. It is quite telling that even over the past year, two or three new stars of this type have been discovered. In fact, we are shortly going to begin a campaign ourselves to try and find an erupting FUOR. If you'll pardon the pun, watch this space!